It didn't seem like it was all that much when I was placing my order...4 bags of onion, 4 bags of potatoes...but the minivan could barely accelerate with this booty! Any guesses on how I will spend my weekend? I haven't been able to get my 1/5th of an acre to produce much food this year...in fact I think it is my pesky chickens. They are highly suspicious with the inordinate amount of time spent roaming in my beds. In lieu of home production I ordered this food from a family in Alpine who runs a home business called Alpine Food Storage. They have some great deals if you are looking to buy in bulk on grains, natural sweeteners, nuts, oils, etc. Of course, you can buy 50 lbs of potatoes instead of 200...hmmm...I definitely have a tendency towards going overboard on things (or I like to think of it as intensity), especially food. 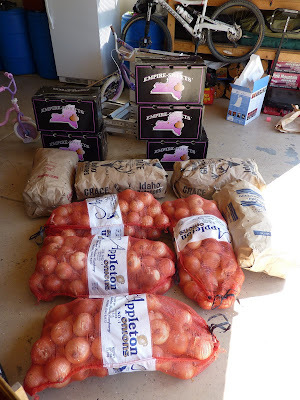 I plan to keep the potatoes and onions in boxes in my basement with sawdust. I've been told they will last up to a year. I still really don't think we will eat this much. But how do you measure something like this? I am not good at measuring. I would rather fare on the side of too much than too little. Keep me posted on how fresh your potatoes & onions stay. We go through both of these items frequently, but I never thought to buy them in bulk. Once again you've been the source of great info for me. :) I looked at the Alpine Food Storage site and I'm excited about a lot of their products! Thanks also for the explanation of the grains... I need to try some of those other ones and do some more quinoa! Toasting it in a pan sounds yummy. What to do with a Toddler while you Homeschool?